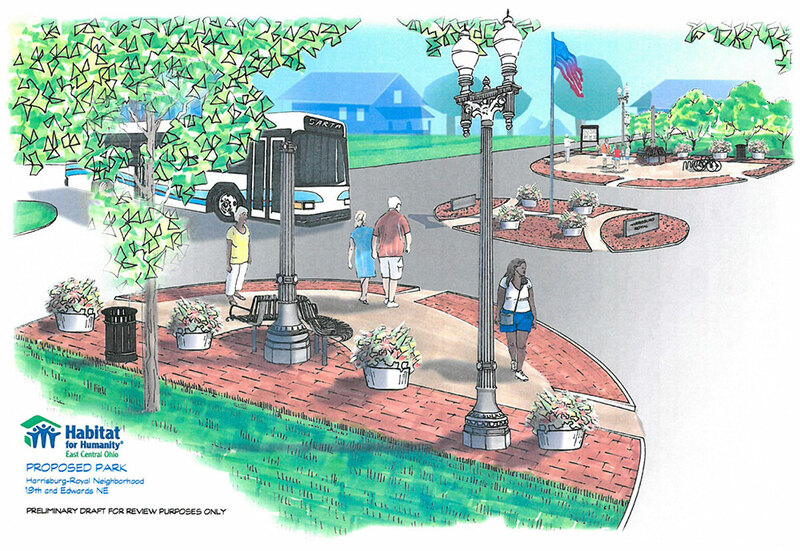 Habitat for Humanity East Central Ohio is partnering with the local transit authority, City of Canton, Canton Rotary, and Canton Parks and Recreation department to design and construct a well-lit, accessible bus stop at the center crossroads of our Renewal Project neighborhood. The current bus stop is virtually unmarked, the area is dark, there are no handicap accommodations, and it is located on two corners of residents’ lawns. The new design includes benches, ramps to the street, drainage features, identity signage, trash receptacles, and lampposts on each side of the street, as well as new landscaping features to maximize and beautify the space while minimizing maintenance. At the center of the crossroads is a small area that is run-down and overgrown. We plan to keep the existing flagpole, as it is in good condition, but replace the plants with lava rock and concrete walkways—which require less maintenance—and install updated signage that is prominent, sturdy, and indicative of the neighborhood. People are consistently walking through the area; they will soon have benches to rest on, trash cans in which to throw away things they pick up from the street or waste from pets, and walkways through the center of the intersection to help them cross the busy road more safely. Additionally, we will be installing a new community board for the neighborhood association, local assets, and residents to communicate information about happenings in the area.